Multiply your inflow of cash and wealth luck by keeping a beautiful wealth vase in your premise, filled with the Laughing Buddha, Gold Lock Coin, Nine Emperors' coins, citrine gems and all the other vital ingredients. Wealth vases were the main means of wealth energy storage by the wealthiest tycoons and people who got rich from using feng shui in ancient times, and making the power and wealth stay with the family for centuries after centuries. That was the reason why the wealth vase was so popular among tycoons or our grandmothers who practised feng shui. One can also own more than one wealth vase to represent multiple sources of income and opportunities. This wealth vase kit consist of a tibetan-styled vase that is specially designed according to the principles of Tibetan monasteries and used by Riponches. The vase is decorated with the all time powerful 8 Auspicious Objects in genuine gold leaf to bring complete good fortune, material luck, spiritual growth, peace, confidence and genuine happiness.Fussy feng shui masters would insist that the vase must have auspicious symbols associated to multiplication of "8" in order to tap the energy of Period 8, thus doubling the effects. Suitable for display in business premise, director's office and home. This wealth vase kit is sold as a very complete set package which is over 50% less in price compared to buying them individually and consisting of the vase, the 5 Element Cloth and Strings, Wealthgod, Lock Coin, 3 Good Luck Coins, Crystal Globe, 9 Emperor Coins, 5 Element Food, 2 Powerful Mantra Rollings and Gemstones as listed below. This Tibetan-styled wealth vase was designed according to the real principles required by Riponches, with an oval-shaped stomach and a cap held with the wish fulling jewel symbol. The wish fulfilling jewel symbol will magnify the wealth power of the vase. This is totally different from the ones found in commercial line. The patterns of the eight auspicious objects were adhered with genuine gold leaf. 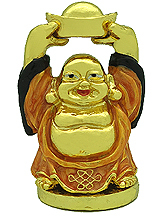 The powerful eight auspicious object is an ultimate generator of good feng shui. The energy emitted from 8 auspicious object becomes even more auspicious and powerful in the 20 years cycle of Period 8 (2004-2024). They bring complete good fortune, material luck, spiritual growth, peace, confidence and genuine happiness. The mystic knot magnifies fortune for Period 8, the conch provides good communications and travel luck, the canopy provides protection against bad energy, the vase is for abundance, the wheel represents success and improvement, the double fishes represents material gains, the lotus for peace and the victory banner symbolizes accumulation of successes. The symbols are also a good protection against bad luck and evil forces. The 5 element cloth set here consist of 5 pieces of cloths. They are made from five major colors of the 5 Elements in Feng Shui, namely white, blue, green, red and yellow. They are used to wrap around the mouth of the wealth vase to represent sealing of the wealth vase with a productive cycle of 5 elements, thus inviting powerful balanced energy and protection from all the 8 directions. The dimension of these quality cloths are specially cut with "auspicious dimensions" with their edges sewn rightfully. The quality strings also come in 5 colors according to 5 elements. The globe represents globalization, international network and smoothness in one's endeavour. Important network produces powerful benefactors which in turn brings potential success and good fortune. This kind of Gold Lock Coin is best rewarding those who desire to become not just rich, but be part of the listed super rich tycoons and millionaire or billionaire list. This gold lock coin magnifies the wealth luck and promises accumulation so that one is able to save the money made. The yang side has a very powerful one chinese word that has hidden meanings of a special 4-worded sentence. It reads "wong karm man liong" in one breathe which means "ten thousand tahil of pure gold". In ancient times, only the royal families, officials and tycoons were able to possess this much of gold! Today, this is equivalent to millions or even billions. On the yin side of the coin, it has the Liu Hai's image fishing for the money frog. This guarantees wealth creation. Lastly, the lock shape of the entire coin locks up the money made so that one can save it for a lifetime. The Wealth Lock Coin is meant to look after and secure your investments, wealth luck and abundance forever. A must ingredient in the wealth vase is 5 types of food that has embedded auspicious meanings for offering to the Wealth God. Do not take for granted that any type of food can be used as offering. Offering food to the Wealth God symbolizes wealth luck and long lasting abundance. It also signifies that the whole family will have endless supply of food. We have carefully selected 5 types of auspicious food that has 5 elements basis to nourish good health and longevity for the family as well, because our body is governed by 5 elements as well such as lungs, liver, kidney, heart etc. They are black beans, green beans, red beans, groundnut and soya beans. Note: These are considered seeds for plants by certain countries such as Australia, USA, Canada etc. They are prohibited by the Quarantine Department. Therefore, they will be removed from your parcel prior to shipping if your country is part of the list and you will not receive them. 2. Strong currencies of different countries to signify opportunities to obtain riches globally. But of course if you are living in countries with strong currencies such as UK or Europe, you may just want to have Pound Sterling in it because other weaker currencies may not be value added to you. Some feng shui masters recommends to hide the wealth vase either by implanting them into the ground before moving into a new house or hiding it in bedrooms' cupboard. But some masters would think this is not necessary. For example, wealth vase hidden in bedroom cupboards and share the space with ones undies or clothes may not be a respectful thing. And it is quite impractical to implant a wealthvase into the ground if groundbreaking is impossible for those living in high rise building or do not wish to do a renovation. In fact, wealth vases can be placed in places where visible as long as it is safe. If there are no kids or other people in the house which could intimidate the wealth vase, it is deemed safe. Or one can even think of placing the wealthvase higher up so that it is out of reach. We have seen some 5-Star hotels successfully incorporating their wealth vases into their design at the lobby by placing gigantic wealth vases high up at four corners of the lobby. One may have one or accumulate more wealth vases at home to represent upward mobility from year to year with more sources of income. This wealth vase kit will come with complete paper instructions on developing and maintaining the wealth vase for every purchase.